Veteran teacher Mark Barnes came up with an entirely new way to engage his students—their way. Recognizing that most students spend a substantial amount of time on computers, Barnes hoped to connect with them on their level by moving his classroom online and into the 21st century. Specifically, Barnes wanted to move away from traditional paper-based activities to a virtual world that excites students to learn about language arts in the same way they learn about the latest gossip on their friend’s Facebook page. Not only does EditMe allow Barnes to choose which pages are public or private, but it also gives him the ability to attach documents and links to outside applications, such as Word and PowerPoint and other websites. EditMe is the complete, powerful solution Barnes was looking for. 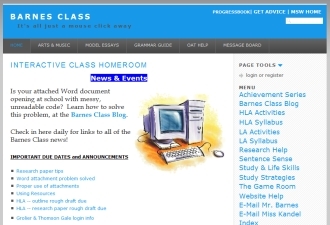 After building his classroom website and watching it evolve into a remarkable resource for students, parents and teachers, Barnes created The Paperless Classroom (thepaperlessclassroom.com), an Internet-based education system that has won praise nationwide. He has written a book on the subject and teaches comprehensive workshops that help teachers create their own virtual classroom online with EditMe, including how to build individual, secure student websites, common classroom pages and ancillary instruction sites.